Other than these, vegetarian steamed fish paste (kamaboko), Chinese cabbage, cabbage, green vegetables, shiitake mushrooms, eringi mushrooms, corn, carrots, green beans, deep-fried bean curds…etc ., can be added to your liking. Move (1) to a pan, add water and kelp soup stock, and then add ingredients in the order of taking long to cook. When it starts boiling, add salt, pepper, and soy sauce. Add peanut butter last to adjust the taste. Put Chinese noodle (boiled in another pan) in the china bowl, pour vegetable soup on top, and it is done. ◆ The volume of soup may be too little for those who like to have a lot of soup, so please adjust the volume. It is best to make the soup taste light. Even if the soup is light, the peanut butter in the soup will cling to the noodles, so nevertheless you can have it deliciously. If that helps, we used Gandharan pink rock salt. This salt is pretty strong in taste, so please adjust it delicately. 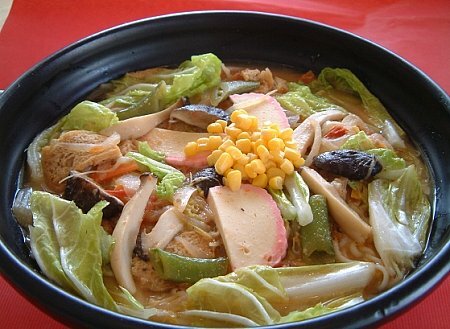 It is also delicious to substitute udon noodles for the Chinese noodles.